Chapter 4 extract: Bearing in mind his contribution to the founding of the club, it is a pity that the Earl of Breadalbane was not present at the [clubhouse] opening ceremony as within four months he died, aged 71, at the Central Station Hotel, Glasgow whilst attending a meeting of railway directors. He was buried five days later on 24th October 1922 at Finlarig Castle, a short 300 yard walk from the second green along the old drive into the estate. Near to his railway, his steamship pier and his golf course it is nevertheless a bleak place to rest. Sir Gavin Campbell at least has his wife, Lady Alma Imogen Leonora Carlotta Graham for company, the last of the Breadalbanes; you would not want to spend the long dark nights of the soul alone in this place. 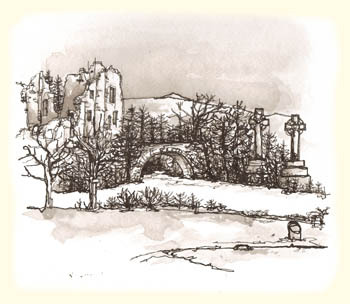 The drawing is the view up the River Lochay from the Ladies’ first tee with an impression of Finlarig Castle.